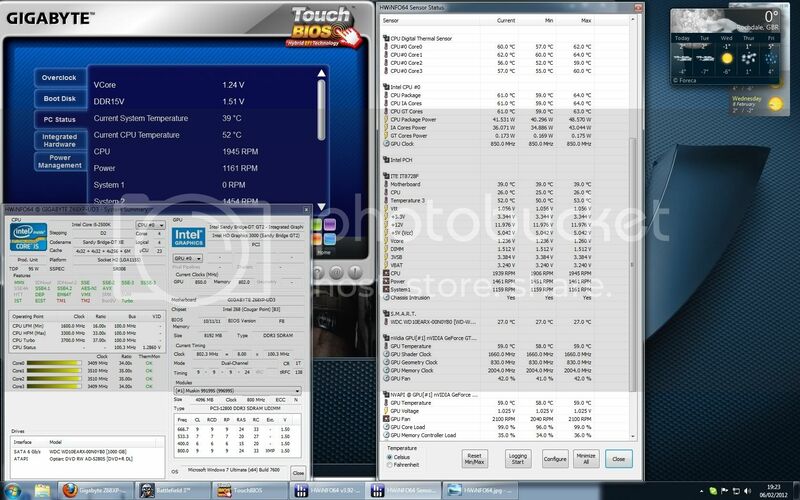 Just noticed temps in HWiNFO are different to Gigabyte's TouchBIOS software. I'd love to know what the extra temp reading is for as this is not shown in TouchBIOS. Hmmm, that's a good question Are you sure that EasyTune is right and your CPU ext. temperature is really only 16 C (maybe your machine is in Sibiria ) ? Am I sure Easytune is right?...not at all lol but I have no way to check unfortunately. Regarding temps, I've just run Battlefield 3 on ultra settings for roughly 30mins to see the difference. Looks (to me) like CPU temp in HWiNFO isnt doing anything. Im hoping sensors in my PC are okay...its a brand new custom build By Aria PC in Manchester UK http://www.aria.co.uk/ so they should be okay. Thanks for the screenshot, that explains it even better. I'll exchange those two temperatures in the next build, so now they will be inline with EasyTune.